Bobby, there's this little thing called the Mafia; its heart beats in Queens. I went to school with their children. You never messed with them because they would at the very least, break your face; at the very most, kill your entire family and dog. That said, he threw down with some old-school Italians from Durso's. It's airing tonight. 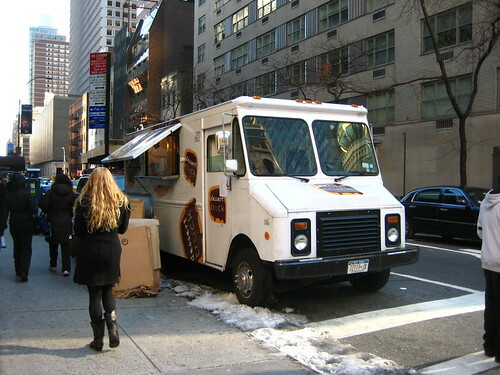 "Throwdown with Bobby Flay" has been filming a lot in New York, most recently doing Bûche de Noël vs. François Payard, and Chocolate Bread Pudding vs. the Dessert Truck. Bobby lost both of those. For the Throwdown, Durso's is making an Osso Buco Ravioli made from "fresh veal shank delicately braised with fresh vegetables and then slow-roasted for several hours." Sounds wonderful to me, I may have to go pick up a few boxes. I do not know who wins, so tune in at 9:00pm EST tonight on the Food Network (check local listings). I will have to catch it on repeat due to my severe LOST addiction and lack of DVR. ADDENDUM: I hear that Bobby did win this Throwdown with his cheese ravioli. I have never seen Bobby Flay ever win a throwdown. Every single episode I've ever watched, he is completely and thoroughly beaten. Yey exciting. Gotta love Durso's! I too will have to catch the rerun though. Nothing comes between me and a new episode of LOST. You grew up in Howard Beach? @ Yvo-no, but I knew a lot of kids from Howard Beach and Ozone Park. And I'm just joking around, the mafia never breaks your face, just your kneecaps. Funny, I thought the mafia lived in Brooklyn. Well at least that's what the Bensonhurst people tell me. I can't believe Flay won - the show must control it's judges. Durso's beats Flay in every possible way! really like the content on your site but I often don't read it because I'm so bugged by the light colored, hard-to-read type and by the fact that clicking to read a whole post opens a new tab. a new tab should only open if a link is navigating you away from a site, not if you're just reading the rest of a post. any chance you'd consider changing these things? 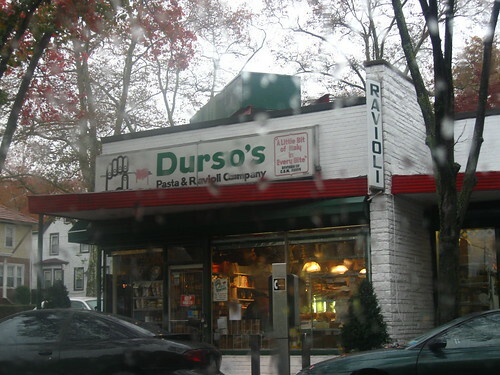 Have you ever been to Durso's? It is wonderful, high quality ingredients, great people behind the counters and the smells are fantastic. Whoever thinks this is a place owned and run by organized crime needs to have their heads examined. These are hard working people who built a business just like any other Mom and Pop places. So whoever wrote that must be VERY JEALOUS! @Hungry: Bensonhurst too! Bensonhurst too. @Moniker: Yeah, I don't know how Flay won. @Anon #1: That's the first time in a year where someone's told us our type is hard to read, but if more agree, we'll think about a change. The two of us prefer having the jump. If you want to read more, you can just click. This way you don't have to skim a whole post you care nothing about, a pet peeve of ours. We can look into it opening in the same window. @Anon #2: Yes, repeatedly. I grew up eating Durso's. I love the people, even have a few friends who've worked there. I'm joking and my regular readers should know that. I'm playing on the fact that many people live in NYC for years and believe that Queens is full of Mexicans, Puerto Ricans, and mobsters. It's amazing the ignorance that exists, even among people living in Manhattan and Brooklyn. If you are actually from Durso's, shoot me an email and I can change the post. I'm only jealous that I can't eat Durso's every day.